Pre-heat the oven to 1800C/3500F/Gas 4. Place the bacon in a roasting tin with the wine, stock, peppercorns, star anise, onion and apple. Cover tightly with foil and roast for an hour. Remove the foil and cook for a further 30 minutes until the bacon is golden brown. Transfer the bacon to a warm plate and leave to rest for at least 15 minutes. Carve and serve. This dish can be eaten hot or cold. 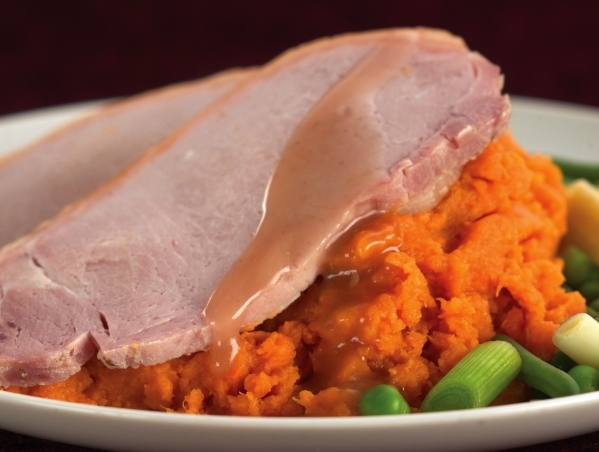 Serve with sweet potato mash and gravy made using the strained stock, thickened with cornflour. For a delicious alternative gravy add a tablespoon of redcurrant jelly and a dash of balsamic vinegar.